I am not naturally fit. I am a 60 yo female, weigh about 75kgs and lug 18kg in my backpack. I am short and naturally stocky. I go to the gym twice a week with a personal trainer, where I do weight-bearing exercises and a light cardio regime, designed specifically to strengthen my muscles and heart to haul my body and backpack up Marion’s steps (short, intense) and Pelion and Du Cane gaps (endurance). 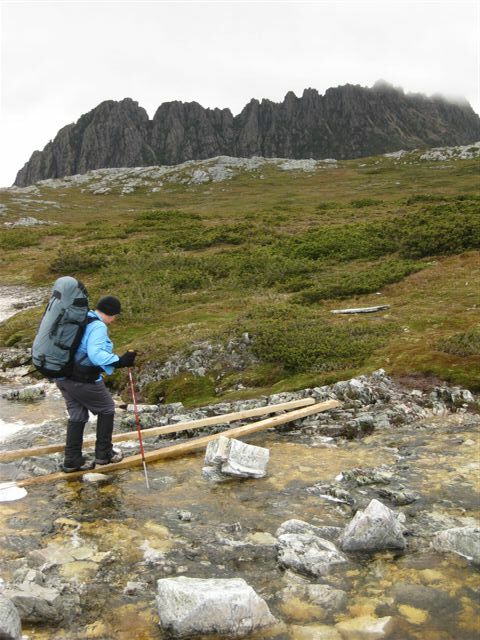 To prepare for my first Overland Track hike two years ago, I hired a treadmill for 6 months. How good am I! For the first month I walked sedately every day for 20 minutes. But I got really bored with that. Then I read the manual and found there were buttons I could press for different inclines. I was off. I used every one, but again only for about 20 minutes a day. By the end of 6 months I was ready for the OT – I thought. My first shock was putting on my fully loaded backpack. Hmm, that’s heavy. But my confidence soared as I set off along the boardwalk at Ronnie’s Creek – with adrenalin surging from the excitement of starting this iconic walk. Then came the climb up through the forest to the first waterfall. I felt knackered. I had to take a break – and start on my day’s supply of scroggin – before I felt able to head off to Crater Lake. Yep, I had to stop for a rest BEFORE Crater Lake. I knew I had a long way to go – and first I had to get up the steps to Marion’s lookout. Looking up from the track below, I knew I wouldn’t manage that grunt– so it was either turn back or get help. There was no way I was going to turn back, and my kind son offered to take my pack up for me. Saved for the moment. While munching yet another snack on that rock ledge overlooking Dove Lake, I pondered my failure – and suddenly realised my mistake. I had done all those kms on the treadmill without my loaded pack – and had probably gained little benefit from my efforts. I knew I would easily walk the flat sections – but I had obviously not prepared my muscles, or my lungs, for these short, very sharp hill climbs – or the long ones. Like most of us, I got fitter as I walked. I fell in love with the Overland Track and decided I would do this walk every year for the rest of my life – but that meant being fit for those hill climbs. When I got home I hit the net. The literature all stressed the importance of getting fit for the task – bingo ! – and that getting fit for a multi day walk can take as little as 16 weeks from scratch. Double bingo! The words ‘interval training’ came up time and time again, so that was worth a deeper look in to. Over the next three weeks OHB will look at these principles of walking-related exercise and interval training. I feel I am on the right track – because walking hills is easier now and my legs feel less fatigued. I will soon be ready to introduce some heart pounding interval training. I like feeling stronger and fitter, and am looking forward to the cooler months when I can get out into the hills of the Blackall Range to add some endurance training. Disclaimer: I am not a qualified fitness or lifestyle coach. I do not claim any professional skill with which to recommend or advise on health or fitness regimes. The information that will be presented in this series is not my original work. It is my interpretation of information readily available in the public domain on the benefits of low impact exercises and interval training for multi-day hiking. It is the basis for my own fitness regime, but it may not suit all readers. Do you follow a fitness regime before a long hiking trip? 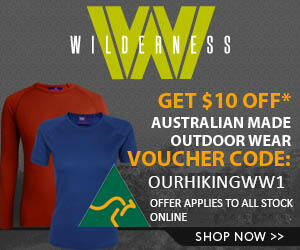 What training do you undertake before a bushwalking adventure? Have you ever ‘hit the wall’, like Georgie, on your first day out? What happened? Did you push on, or retire gracefully/relunctantly? We would love to hear your story, so please share it below. The best training is to do weekend backpacks, and it can be very enjoyable. Not quite as good are daywalks at a harder level than the backpack. As an alternative, I’ve walked bush tracks near home with a pack loaded up to 15+ kg, on a Saturday afternoon, doing about 10km in 3 hr. Then a daywalk on the Sunday. Unfortunately nothing prepares you for offtrack backpacking other than offtrack backpacking, so the first day or two is always hard. In Vancouver we have a local hike called the Grouse Grind. It’s about 2800′ of vertical over 1.8 miles. I like to hike it both up and down (there’s an aerial tram they encourage you to take down) a few times a week when I’m training for something. I know the pack always changes the hike but I never train with one. It’s my thighs that are always most sore after a long hike and that’s always from the descent so I try to work on those muscles a lot. I had a very simular experience. I did some weight training and cycling with some walking without a pack or just a day pack. As training it helps but it doesn’t prepare you for the additional weight and the additional stress on the ankles and knees. After three hours on the Freycinet walk I realised my mistake and I went home to change my training program and try again. At the moment I am doing an hour walk up a very long hill near my house with increasing weight as I get fitter. Unfortunately when I first started this I increased my weight a bit quickly and hurt my knee which put me out of commission for about 7 months so it pays to go slow. I am up and going again and increasing the weight in my bag at a much slower rate. You live and learn. Wow, out of commission for 7 months? What did you do, carry 30 kg. Hope you did not need an operation. Good luck with your training, hope you get on a good trip soon. Sorry Frank I didn’t see your comment. No it wasn’t 30kg’s it was just 15kg’s but I am not as young as I used to be. I just twisted my knee the wrong direction and that’s all it took. No operation thank god but it has been a very slow recovery. Very excited to read this series. The things I’ve done to my poor legs with not enough preparation! Welcome back, love the music on your site! Bing or someone else? Get out on the hill – the gyms no training for outdoors! Sadly I don’t believe there are any shortcuts just get in plenty of hiking – weekends tips are best as Ken suggests – start with a lightish pack. I think putting on a heavy pack and doing a couple of day hikes is a good idea too – you need to stengthen your back muscles as well your legs. Also if you don’t ever walk with a pack it’ll come as something of a demoralising shock when you put it on the first morning and the first uphill kills. The usual training regime for me involves ditching the car, and walking everywhere that I can. Carry a backpack and load it with around 10kg to start with, and just walk the places you normally would in a day. The milk bar, the post office, etc. Then I generally take it up a notch, and fill my hiking pack with around 20 – 25kg and do some training a few days a week up a large incline. Fortunately, we have a 200 meter stretch of track up a 40 degree incline here that does just the trick. If I can make it up and down that stretch 5 times, that means that walking up to Marions Lookout on those horrible steps will be a breeze. Lastly, if I feel I am struggling, I will do a weekend walk or two before the hike. Maybe Wilsons Prom, Freycinet Peninsula, or even a 3 day hike across Mt Howitt or something. I’ll also keep up with a protein rich diet, primarily eating things like Tuna and Chicken after a workout, so that my muscles can repair and build up a little. Cant hurt. That his how a mate of mine trained for the Arthurs recently, full pack, 2 hrs every couple of days. He dropped weight like crazy and looked as fit as a mallie bull! Frank can you tell me more about The Horse Track please.. I’ll be doing the Overland for the second time in a few weeks. I maintain a pretty good level of fitness, walking 30 – 40 km every week, adding the pack in the month beforehand, but I have a lung condition and those short sharp pinches really get to me ! 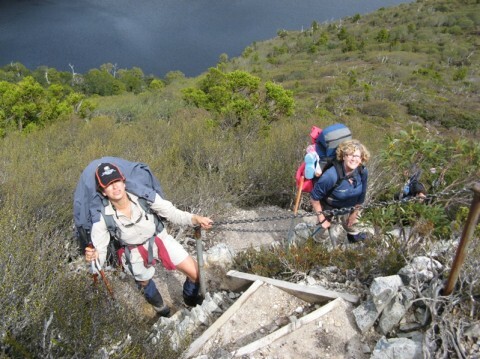 The Overland is our training jump-up for the Oxfam Trailwalk in June – 100km in 48 hours. The “Horse Track” is a track off to the Right just prior to Crater Falls – just before you reach Crater Lake – it skirts the East side of Crater Lake and re-joins the OT just before Kitchen Hut. I start my routine at least 3 months before I go. I have an office job which is not physical at all. I start off by walking as much as I can in my day to day activities – park the car further away, walk to the shop for a few groceries etc. I also do day walks on the weekend i.e. on Sunday I walked up Mt Coot-tha in Brisbane with a small pack (3kg), I will slowly increase the weight carried over the next few months until I reach 15kg. I normally walk with 18kg on a track like the OT. I hope to a few overnight walks as well in preparation. At home when watching TV I will get on the step machine also with a pack & increase the weight over several months. I also get on the rowing machine to help with the cardio. I am fine on the straights, but the hills kill me! Lying on the couch is the mental preparation! Keep up the good work. Thanks Trixie – at least you are mentally prepared…..
It’s great to see the level of interest everyone has in getting fit for hiking. I have learned that as I get older preparation becomes extremely important. While it might have been ok for me to do a weekend walk for training with an 18kg pack when I was younger. Now that I am getting older I need to do some training before I attempt that, just to make sure I can avoid injury. You have got to be willing to put the time in and go slow. After all it’s not just a matter of not making the distance it may be some very unpleasant surgery. Thanks for this discussion and to Georgie for her program which helped me train for outback walking in the Northern Territory. Now back home in Tasmania I’ve continued my walking program, extending the distance and adding some new hills while preparing for the next adventure. Worth a mention – the soles of my favourite KEEN hiking boots went soft in the NT heat, luckily I had also taken along a new pair of Vasque boots with vibram soles that maintained their stiffness providing much better stability and foot support. Interesting about the Keen’s. I wonder if the soles soften after a period of time? How long have you had them? Lucky you took the other boots…. The final installment in Georgies fitness series will be up live later this week. Hope it is useful! We were walking on angular sharp rocks a lot of the time. I think the heat reflecting back from the rocks as well as the general tropical warmth were not a good combo for that particular type of sole. The soles themselves didn’t fall apart, the shoes just felt mushy and failed to hold my feet firmly. They have been great boots down here and I would certainly buy another pair, but not for hot climate walking. But what happens when I go straight through a bog hole in Tasmania up to my ahem, crutch? Will they stay dry inside then? Or when I cross a river? That being said they do sound tempting….. Sorry if my Sno-seal comment was misleading. It’s a joke! Must try snow seal with my boots, looks a great product. Hitting the wall,only happened once,i was 11klms into a 14km jog that i had done many times before,i had plenty of aerobic puff still in me,but my legs turned to iron and that was it,it took me a hour to walk home and my running distance wise was over from then on. With no prior training,i done the Gow on my own,with 25kgs on back/? No hikeing before that,and slugged my way to the end,june,2011. I hike now with no more than 18kgplus water. I’m a 45 year old 67kg male and by coincidence, my pack load is around 18 kg, although starting from my next walk I aim to reduce this. I have only been hiking a year, but the way I train is that 4 days a week during the working lunch hour I hike around 3 km with a 20kg rucksack and try to maintain a fast 7 kph pace. At first I found this extremely tiring and had sore knees as a result of it. But after a month or so the knees stopped being sore and I found that the hill climbing aspect of my walks was much easier. That said I still stop regularly, mainly to take photos for my photo journals, but these little 10 sec stops do help the old knees to get ready for the next stretch! I am a 64 yr old female with big back problems but I want to hike, so I am just starting out to try and increase my strength. I have doubts about being able to carry a large pack ever, due to back issues but I can still do big hikes if I can find a way to get my pack delivered by someone else. What do you think should be my first graining schedule? I am giving myself 12 months to get fitter and stonger, so anything you can suggest would be really helpful. With the info you provided I would suggest a walk like the Coast to Coast walk in the UK – it is up there with the best walks I have ever done. Baggage Transfer between overnight stops, decent bed for a bad back each night – even a pint of Real Ale each night; all you carry is a daypack with your lunch and the essentials. Just a thought. Avoiding sore knees was high on my list of pros and cons of going to supervised sessions at the gym to get fit, or pounding the streets on my own, not knowing what damage I was doing and the future effects of. At my age I can’t afford to do anything that will put me off hiking, as I am a lazy person by nature, and any excuse might be good enough. So I decided to get fit using a low-impact gym system, that, while it was not in the pleasant surroundings of the great outdoors, I knew would get me out there and enjoy my planned hikes. I will do anything to keep walking the OT … well, almost anything. Regards, Georgie. If someone has said this already, sorry. But to put it simply I have a saying. “Train hard trek easy” In a nut shell that’s it. My first ever trek was Kokoda at 54 years of age. I am 5ft 7in and 74kg so not a big bloke. I trained for 8 months for that one and because of the on track training I did it was a success. Just a day pack though as we had porters. Since then I have done the Overland Track and the South Coast Track in Tassie. The OLT was pretty easy but I knew to do the SCT carrying 25kg was going to be tuff as! So for two months prior I hit the stairs in the bush near where I work. There is 300 to the top. By the time I felt ready for the SCT I was doing 11 laps with 31kg. That’s 3300 up and 3300 down. This would take 3 1/2 hours. No rush just slug it out taking great care of the aging knees etc. If you have time pre a trek go bush as much as possible. For me I can do the stairs almost daily before work. TRAIN HARD TREK EASY!!! Great advice thanks Tim! Keep up the great training and trips. Hi Georgie – thank you so very much – just what i am looking for – 60yrs old and 75kgs looking to do 5 day – medium level altitude – hiking in Nepal in about 11 weeks time. It is not long days of hiking but it is 5 days in a row. I start today with your recommended program – will let you know how it goes. There are many ways to get fit but I am a great believer in doing what you are training for i.e. get your pack on your back and hike. At least you will know when you are fit enough to do it all day without thinking about it. For inspiration read “Wild” by Cheryl Strayed. Hello all, my training tip is to use 2 litre wine bladders filled with water in a day pack. Easy to load up, 2kg each. You just have to find someone to drink the wine. Flip off the black cap and fill up. They are also soft and easy on your back. 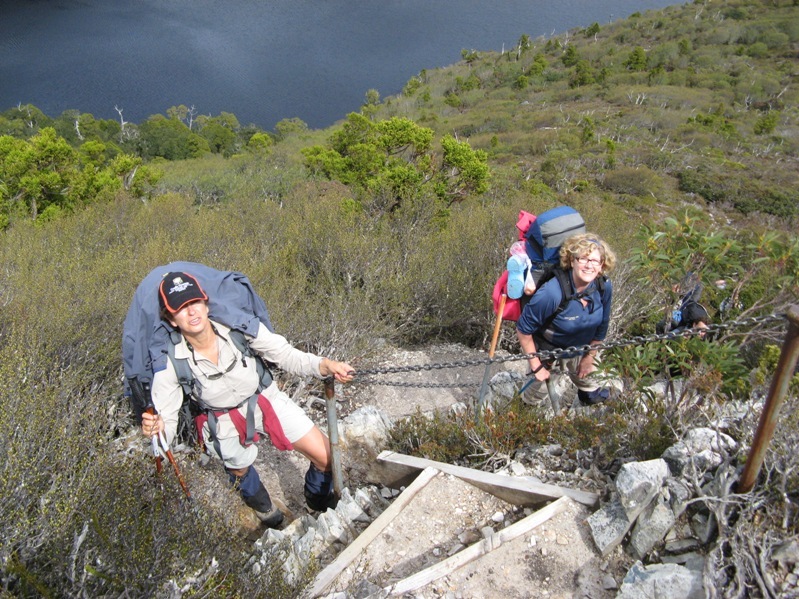 The training paid off on the Overland Track last November. We had gale force winds and a foot of snow. Loved it. Organise a party themed around Spanish food, use the red cask wine to make Sangria (and make sure you invite enough friends to consume the lot!). I’m a 65 year old lady. Have climbed Kilimanjaro, Everest Base Camp, Mt Fuji, Inca Trail and others. My tip is to to stairs. I run as well, but the best training is stairs. I start about 6 weeks before a trek. You use different muscles to do different things and the stairs not only strengthen different muscles but also get your cardio really going. Lot’s of good tips but the important thing is to start your planned trek as fresh as a daisy and fighting fit. Lot of people mentioned their ageing knees and going uphill is hard on knees, but not as much as coming downhills with a pack on. I learnt a long time ago the value of trekking poles and looking after your knees. My suggestion would be to invest in a pair and learn how to use them (lots of web sites) – Frank even had a blog of them somewhere. So while you train with them you also give your upper-body a workout as well (if you use them to propel you along) – and you walk faster. Just my two cents worth. I’m going to do the over lander track in November. Just wondering if this is a good time to go? November will be great. Yopu should get good weather. I am 57 years old and have never been to the gym nor worked out but am blessed with a metabolism and good eating habits that have made my 6 foot/82kg frame easy to maintain. I have competed in 3 Oxfam Trailwalkers which is 100km of bush tracks over 48hrs. This did need training. I read than any muscles you have will begin to degrade after 3 days of non-use – this is why your legs get so thin and wobbly if you’re sick in bed for a week with the flu. I trained twice a week by walking 25km each time. This takes 4 hours over fairly level ground. 3 months of this meant I had no soreness issues on the events and was very familiar with the feelings of tiredness and was not distressed when they inevitably came on. This is muscle fitness without any real cardio vascular exercise so the real athletes would power past me on the climbs but I was never in need of rest stops.